These diaper cake instructions are all you need as a jumping off point to create your own amazing tiered diaper gift. Once you have the basics down you can personalize the cake in any way you like. A diaper cake is great for hiding other crafty gifts, like handmade baby clothes and handmade baby toys that you can also make! Step One: Roll up your diaper. Depending on the diapers, you can get a smoother tube either by rolling the crotch in first, or by rolling the top waist first. Secure the tube by either a single rubber band, two clear rubber bands or string. A single rubber band works fine and is the fastest method. The "pros" use two clear rubber bands (one on each end) for a completely uniform look. String also will work in a pinch. Step Two: Combine diapers together with a large rubberband. The key to a nice circular shape is to have one diaper in the center and six diapers all around it. This is the base of any size cake and works well as the smallest top tier. For the larger tiers, continue adding diapers all the way around the outer edge. (Alternate) Step Two: Another diaper cake instructions option is to "hide" an item in the center and build the diapers around it, again using a rubberband. This example uses a wooden rattle but other ideas include bottles, sippy cups, dolls or rolled up clothes. Step Three: Once you have at least two tiers adjust the diapers so that they all look uniform on the outside. Place bottom tier on a platter (a spray painted round cardboard pizza tray works well and is cheap but an actual platter can be part of the gift) and attach with double sided tape. I use only a tiny amount as to not damage the diapers, it is just to make it not slip off too easily. Add ribbons around the tiers and secure the ends together with clear tape. Optional Ribbon Flowers: To make "flowers" use wire ribbon (it must be wired) and wrap around a pen then slide off. Shape the ribbon flower and then attach to the cake either with tape or just tuck them in. Optional Add Toys & Decoration: By now if you are using Pampers like I did for this example you'll surely have a headache from the smell of them. Use proper ventilation, those things are fragrant! Add toys, onesies, spoons, baby care items and any other things you can think of as part of your decoration. You can stick to a theme or "hide" as much stuff as you can. You can easily roll up onesies, wash cloths, socks and other small cloth items and replace diapers inside the cake or just tuck them in. You could even "frost" the cake by wrapping the whole thing in baby blankets. This is the fun part of the diaper cake instructions of course, so get creative! 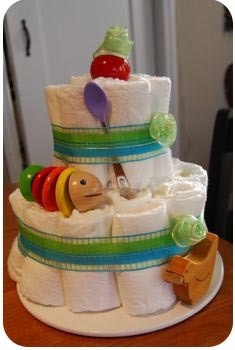 Have fun coming up with your own unique diaper cake designs! For the example shown, only about 25 size 2 diapers were used, so obviously you can make one much larger if you like. Check with the recipient if she has a specific brand of diapers she plans on using and of course whether she plans on using disposables at all. If your gift recipient plans on using cloth diapers check out these other diaper crafts projects that might be more suitable. Back to the top of the Diaper Cake Instructions page.